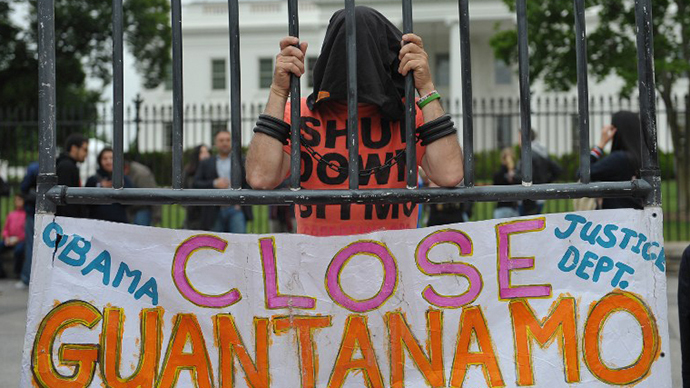 Over 100 Guantanamo prisoners continue their hunger strike in protest against unlawful – and as it turns out, violent – detention. RT met with the lawyer of inmate Moath al Alawi, who has been shot by guards, denied medical treatment and force-fed. 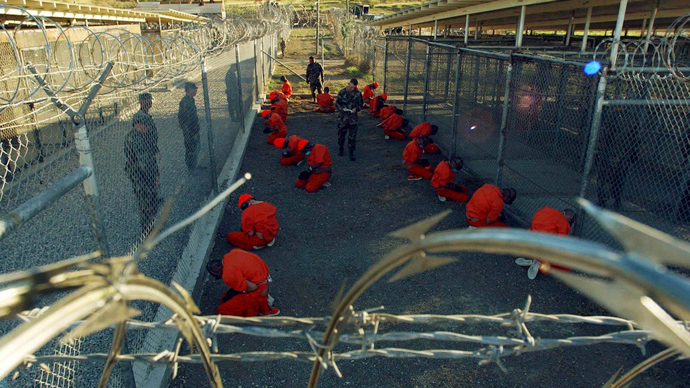 A reported 103 of Guantanamo’s 166 prisoners are participating in the hunger strike, which has lasted for more than 100 days. Over the weekend, hacktivist group Anonymous marked the 100th day of the protest with “twitterstorms, email bombs and fax bombs” aimed at drawing worldwide attention to the hunger strikers. 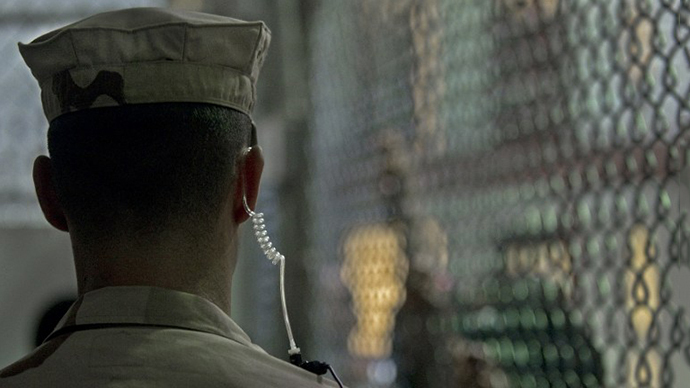 The US Military responded to ‘Operation Guantanamo’ by restricting wireless internet access at the Guantanamo Bay detention camp. RT’s Marina Portnaya spoke with Ramzi Kassem, who represents Moath al Alawi, a prisoner held at Guantanamo without charge for 11 years. RT: Thank you for your time. When was you client shot and what were the circumstances of the shooting? Ramzi Kassem: On Saturday, April 13, 2013 the Guantanamo military prisoner administration decided to raid Camp 6, which is a prison facility at Guantanamo, where my client Mr. Alawi is being imprisoned. They conducted that raid in order to move all of the prisoners into solitary confinement. And that was just one additional way that the prison administration wanted to try to break the hunger strike. What happened on that day according to Mr. Alawi is that in that process he was shot without any warning for absolutely no good reason by one of the US Army guards at dangerously close range using rubber-coated steel bullets that are only safely used outside of a certain range. He was shot in five places: One shot was around the heart, another shot was in his elbow, another was in his shoulder, and there were a couple of impacts on his thighs. Particularly, the shot that went to his heart at that close of a range, even a rubber-coated steel bullet, can penetrate skin and can be fatal. 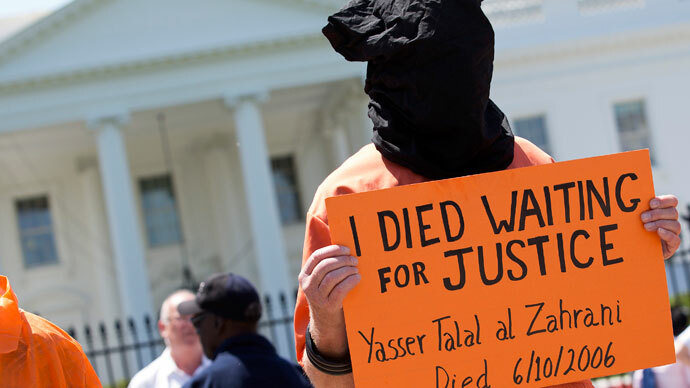 The authorities of Guantanamo endangered Mr. Alawi’s life for no reason. They gave him no warning, fired at him repeatedly and then, following that fact, they delayed medical treatment that he should have received immediately. RT: Has the US government acknowledged that this shooting did take place? RK:Absolutely. I have received confirmation in writing by an email from the Department of Justice that Mr. Alawi sustained what they described as minor injuries. But when I heard the description from Mr. Alawi himself, it was very different from what I saw on the government’s email. We also received confirmation in writing from the US government via email that Mr. Alawi was force-fed. This is also a violation of international law. The fact that it is done in an unnecessarily painful and brutal way – prisoners are strapped down to these restraining chairs, that they have tubes forced down through their noses into their stomach. There are many other ways to tube-feed prisoners, even if these prisoners wished to be tube-fed, and the US government is again doing this in a deliberately violent way in order to break the hunger strikers. RT: Correct me if I am wrong: He is being held in Guantanamo without charges against him? RK:That’s correct. Mr. Alawi has never been charged with any crime. We have no reason to believe that the US government has any interest in charging him with an actual crime be it at a real court or at the military commission. The reality is that Mr. Alawi has been at Guantanamo for over 11 years without fair process and that is a reason he is on hunger strike today. RT:US President Barack Obama is expected to address the nation on Thursday speaking about Guantanamo detention center, and I assume he would address this hunger strike. What would you like to hear? RK:I can tell what I would not like to hear. I don’t want to hear the repetition of the promises that President Obama has been making for years. I don’t want to hear that he is going to appoint some official who will be responsible for closing Guantanamo. We’ve had an official like that for years, and Guantanamo was not closed. I don’t want to hear about the administrative review mechanisms, because we had many before that and they did not lead to any meaningful progress. The only official who is responsible for the existence of Guantanamo today as far as I am concerned and my client is concerned is President Obama himself. He need to take concrete steps towards closing that prison and I don’t believe the men in Guantanamo will interrupt their hunger strike unless President Obama take such concrete steps. One very obvious concrete step he can take is to begin by releasing some prisoners, who are approved for transfer, who can be repatriated or resettled in another country like another one of my clients Shaker Aamer, who has been approved for transfer for years. The UK has been asking for his release, that’s the US oldest and most trustful allies. He is a very natural first step if the president is about closing the Guantanamo. We need actions, deeds, not words.